Bringing a new puppy home is truly exciting. There are many wondrous things about puppies, things that become apparent only when your household has been blessed with such a creature. Puppies have an innate ability to bring out the most intense emotions from their owners. As you will soon discover, these range from the delight you will feel when watching Fido at play, to the suffering caused when the he continues to howl from eleven p.m until three a.m for the third night in a row. Of course, all of us would rather avoid the latter extreme – fortunately there are some fairly fail-safe ways of helping puppy settle in! more likely to produce from the front end than the back! 2. Begin toilet training immediately. When you arrive home, take the puppy to his designated toilet area and give a cue like “Be busy.” Say it only once, and wait to see if he produces within ten minutes. If he does, praise softly as he is performing: and treat with a small but tasty morsel the moment he’s finished. If possible, begin a fun game with a new toy – this will encourage the pup to go immediately next time to get to the fun and games faster! Alternatively, if nothing happens, take puppy inside and try again every fifteen minutes, or sooner if you see any signs of circling and sniffing at the floor. Eight-week-old puppies will usually need the toilet every hour. To prevent accidents, confine your pup overnight, and take him out hourly when you are there. 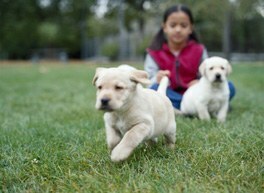 Pups are also likely to go after eating, sleeping and periods of excitement or play. Be vigilant. Any mistakes are down to you, so purchase a pet stain and odour remover for your carpets and refrain from berating the dog. 3. Stick to the pup’s original diet for at least a week before you change to anything else. Changes in diet will upset the pup’s sensitive digestive system, something you really don’t want while housetraining! 4. Play with your puppy, handling him gently and encouraging him to interact with you. Building a bond between yourself and the new arrival is essential, and besides, having fun with you will take his mind off any anxiety he may experience during the first few days. 5. Give your puppy plenty of toys to chew on. Buy toys of different shapes, sizes and textures to ensure that he explores his playthings and not your possessions! Only ever leave puppies with specially designed chew toys: When playing with anything else he must always be supervised. 6. Buy a crate! This collapsable metal ‘cage’ is an absolute godsend when it comes to helping puppies settle. When used correctly, the crate will provide a cosy den for your dog, which he will be happy to use for the rest of his life, but leaving your puppy confined for excessively long periods however will result in the crate becoming something of a juvenile detention center. Be fair and your puppy will come to love crate time! When it comes to night time, place the crate in your own bedroom. Be sensitive to the plight of the baby: he’s been torn away from his mother and littermates, he will no doubt feel alone and frightened. Even if you later wish for your dog to sleep elsewhere, keeping him close now will not only help you all get a good night’s sleep, but will also strengthen the bond you will share. Despite being close, he may still cry. This must not be encouraged, and any ‘comforting’ words will make things worse since puppy will construe this as praise. If he does make any noise, a quick tap on the top of the crate accompanied with a command such as ‘settle!’ will probably help. When there is silence, praise softly. 7. Don’t be afraid to lay down some rules. Basic obedience can also be taught after a couple of days, as long as it is done in brief sessions involving lots of food and fun! A determined ‘No!’ – spoken, not shouted – will alert your puppy when he steps out of line. Harsh verbal or physical corrections may damage your puppy for life. 8. Be patient. Remember he’s only a baby! Try not to raise your voice at him in anger. If you ever feel tempted, remember that he is not doing anything out of spite, only because he does not yet understand what you want. Show him kindly and firmly and he will quickly learn to please you. If he does something wrong, don’t stay angry at him. While you have your family, friends, hobbies and work, your puppy only has you.